In a stunning move, prosecutors in Chicago dropped all charges against "Empire" actor Jussie Smollett on Tuesday despite acknowleging Smollet fabricated a street attack on himself in an attempt to get a pay raise. “We stand behind the investigation and the facts revealed,” said Joe Magats, the first assistant state attorney in Illinois, who took over the case when his boss, State Attorney Kim Foxx, recused herself from the probe after it surfaced that she had been in touch with Smollett’s family. “We believe he did what he was charged with doing,” Magats said in an interview with Chicago ABC station WLS. “This was not an exoneration. To say that he was exonerated by us or anyone is not true,” he said. Magats also said that he was satisfied with Smollett forfeiting the 10 percent of a $100,000 bond that he put up, and pre-emptively completing community service prior to getting the charges dropped. Smollett could still face federal charges. The Federal Bureau of Investigation (FBI) and the U.S. Postal Inspection Service are continuing their probe -- reported by ABC News on Feb. 20 -- into whether Smollett played a role in sending a threatening letter to himself prior to the allegedly staged attack on him, a law enforcement official briefed on the matter told ABC News on Tuesday. The dismissal of the state's case has not impacted the federal probe, the source said -- who added that the FBI investigation remained ongoing even after the “Empire” actor was hit with Illinois state charges. The FBI’s Chicago office declined to comment on the status of the investigation. The unanticipated development shocked Chicago, and prompted angry reactions from Mayor Rahm Emanuel and Police Superintendent Eddie Johnson, who each reiterated their belief that the incident was a hoax -- with Emanuel wondering aloud, "Is there no decency in this man?" The duo went on to accuse the "Empire" actor of receiving preferential treatment by the Illinois State Attorney's Office. 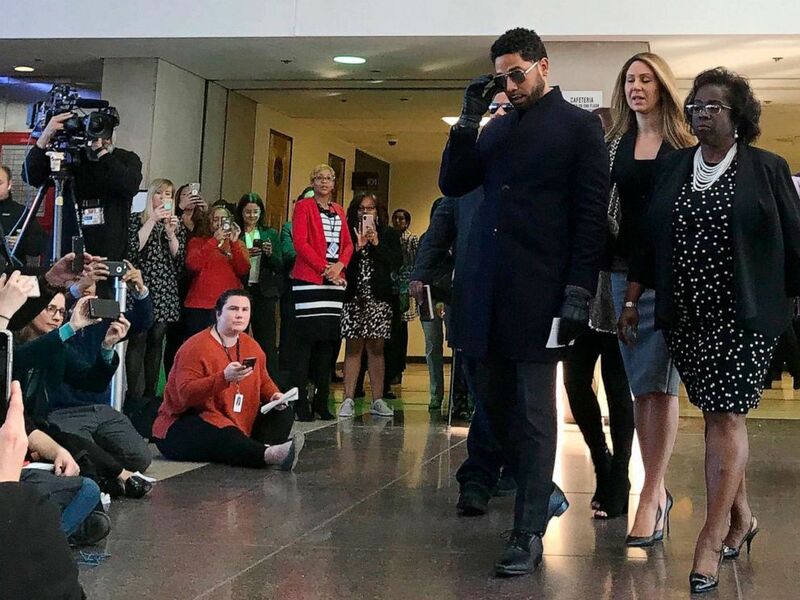 Smollett appeared at an emergency court hearing in Chicago Tuesday, where prosecutors told a judge they were dismissing the 16 charges of disorderly conduct and filing a false police report against the 36-year-old actor. Prosecutors also agreed to immediately seal the case. Following the court hearing, Smollett publicly spoke, thanking his attorneys, friends, the citizens of Chicago and "the state of Illinois for attempting to do what is right." Actor Jussie Smollett speaks to reporters at the Leighton Criminal Courthouse in Chicago after prosecutors dropped all charges against him, March 26, 2019. "I want you to know that not for a moment was it in vain," Smollett said outside the courtroom. "I've been truthful and consistent on every single level since day one. I would not be my mother's son if I was capable of one drop of what I was accused of. "This has been an incredibly difficult time," he said. "Honestly, one of the worst of my entire life. But I am a man of faith and I'm a man that has knowledge of my history and I would not bring my family, our lives, or the movement into a fire like this. I just wouldn't. Now I'd like nothing more than to just get back to work and move on with my life. But make no mistake I will always continue to fight for justice, equality and betterment of marginalized people everywhere." But Emanuel and Johnson said they were sticking by the police investigation that found Smollett's claims of being assaulted on a street in Chicago was a hoax. "This is without a doubt a whitewash of justice," Emanuel said at a news conference Tuesday afternoon. "There is no accountability. It is wrong, full stop." Johnson said he was surprised to learn of the decision to drop charges against Smollett while attending a police academy graduation with Mayor Emanuel. A furious Johnson said prosecutors brokered a deal with Smollett in secrecy. "I'm sure we all know what happened this morning," Johnson said at his press conference. "Do I think justice was served? No. What do I think justice is? I think this city is owed an apology." "At the end of the day, it's Mr. Smollett who committed this hoax, period," Johnson said. "I heard that they wanted their day in court with TV cameras so America could know the truth, and they chose to hide behind secrecy and broker a deal to circumvent the judicial system." Johnson said that he and Emanuel only learned about the charges being dropped when it was announced publicly. "We found out about it when you all did," Johnson said of the lack of notice from the State's Attorney Office regarding the dropped charges. "I'm sure we'll have some conversation after this. But again at the end of the day Mr. Smollett committed this hoax." Emanuel noted that "a sliver" of the evidence was presented to a grand jury, which indicted Smollett. He said Smollett used race and privilege to "get off scott free" and that the actor has shown no remorse or accountability for his actions. “A person using hate crime laws that are on the books to protect people who are minorities, and you turn around and use them to advance your career?" Emanuel said. "Is there no decency in this man?" Empire actor Jussie Smollett arrives at a news conference after a hearing at the Leighton Criminal Court Building, March 26, 2019, in Chicago. Chicago Police Department spokesman Anthony Gugliemi issued a tweet on his verified account shortly after the mayor and police superintendent spoke, heralding the work of investigators and suggesting that "In our experience, innocent individuals don't forget bond & perform community service in exchange for dropped charges." Emanuel had earlier said that "the financial cost of $10,000 doesn’t even come close to what the city spent in terms of resources." I've been truthful and consistent on every single level since day one. I would not be my mother's son if I was capable of one drop of what I was accused of. But Magats said that in addition to forfeiting his bond, Smollett also did community service for Operation PUSH, the non-profit community organization founded by the Rev. Jesse Jackson. He also noted that Smollett did not have a criminal history. “Our goal and our No. 1 priority is combating violent crime and the drivers of violence and we look to our resources to do that and I don’t think that Mr. Smollett is a driver of violence or a violent individual,” Magats said. He said the decision to reach a disposition in the case was "mine and mine alone." He said he did not consult with Foxx before making the decision. "There was nothing new that came up," he said. "We stand behind the investigation that CPD did. We stand behind the decision to approve charges and to indict him. The investigation itself that was done by CPD was outstanding." The organization where Smollett did community service, Rainbow PUSH Coalition, said in a statement that the community service was not court ordered. "During this period of disruption to his life and livelihood, Jussie has spent time here helping to advance this important work. There was no court-ordered community service here," according to the statement. Patricia Brown Holmes, one of Smollett's lawyers, said it was not unusual for people in similar situations as Smollett to forfeit their bond. She said Smollett "voluntarily" forfeited his bond in order to expedite moving on with his career and his life. "There is no deal," Holmes said. "The state dismissed the charges." "We believe that it was the correct result in this case," she said. "We're very happy for this result and we are very anxious for Jussie to get on with his career and his life, and to move forward." Asked if she had anything to say to the Chicago Police Department, Holmes said, "We have nothing to say to the police department except to investigate charges and not try their cases in the press, but to allow matters to be investigated and allow the state to investigate and to bring charges and not to jump ahead and utilize the press to convict people before they are tried in a court of law." In a joint statement earlier Tuesday, Holmes and Tina Glandian, another one of Smollett's attorneys, said the actor's "record has been wiped clean of the filing of this tragic complaint against him." "Jussie was attacked by two people he was unable to identify on January 29th. He was a victim who was vilified and made to appear as a perpetrator as a result of false and inappropriate remarks made to the public causing an inappropriate rush to judgment," the defense attorneys said. "Jussie and many others were hurt by these unfair and unwarranted actions. This entire situation is a reminder that there should never be an attempt to prove a case in the court of public opinion. That is wrong. It is a reminder that a victim, in this case Jussie, deserves dignity and respect. Dismissal of charges against the victim in this case was the only just result." In mid-Februrary, in an exclusive interview with "Good Morning America" anchor Robin Roberts, Smollett said he was heartbroken when he found out that people questioned the details of his story. He defended himself against skeptics who pointed out that it wasn't until a follow-up interview with the police that he mentioned that the assailants yelled "MAGA Country!" at him. He also complained about erroneous reports that he had told police that the attackers were actually wearing red MAGA hats. In the ABC News interview, Smollett also confirmed reports that he was initially reluctant to contact the police or hand over his cellphone to help with the investigation. "They wanted me to give my phone to the tech for three to four hours. I'm sorry but -- I'm not gonna do that," he said. "Because I have private pictures and videos and numbers: my partner's number, my family's number, my cast mate's number, my friends' numbers, my private emails, my private songs, my private voice memos." 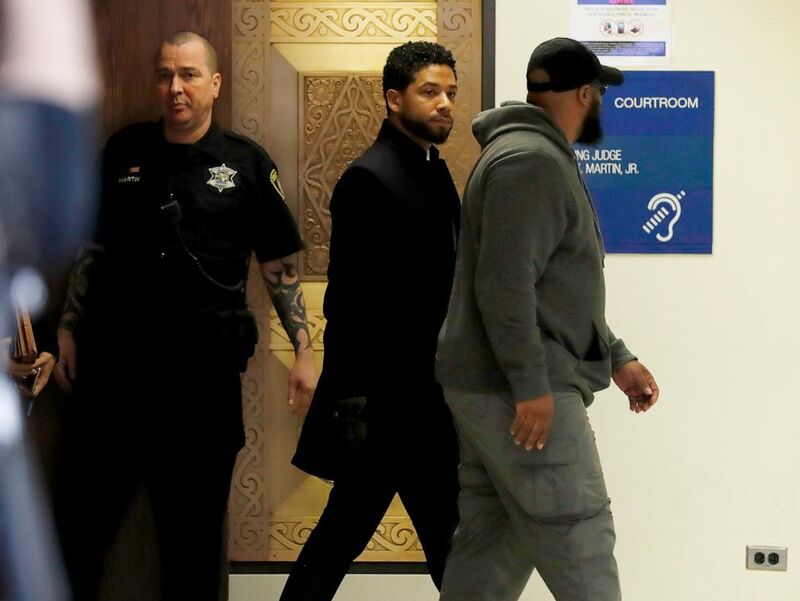 Actor Jussie Smollett exits courtroom 101 into the hallway at the Leighton Criminal Court Building following an emergency hearing over his disorderly conduct charges on March 26, 2019. Smollett told police that on Jan. 29, he was walking on a street near his apartment around 2 a.m. when he was set upon by two men. The attackers allegedly shouted racist and homophobic slurs before hitting him, pouring “an unknown chemical substance” on him -- possibly bleach -- and wrapping a rope around his neck, he told detectives. Police said Smollett's story of being the victim of an attack began to unravel when police tracked down two men, brothers Abimbola and Olabinjo Osundairo, who they said were seen in a security video near where Smollett said he was assaulted and around the same time it supposedly occurred. The Osundairo brothers claimed, according to police, that Smollett paid them $3,500 to help him orchestrate and stage the crime after he became upset that a the letter threatening him, sent Jan. 22 to the Fox studio where the television series "Empire" is filmed, did not get enough attention, law enforcement sources told ABC News. The memo line on the $3,500 check read that it was for personal training, sources said. The brothers' attorney said the check from Smollett was payment for both the personal training and their help in staging the attack. "The two brothers have said they attacked him," Holmes said Tuesday of the Osundairo brothers, who are black. 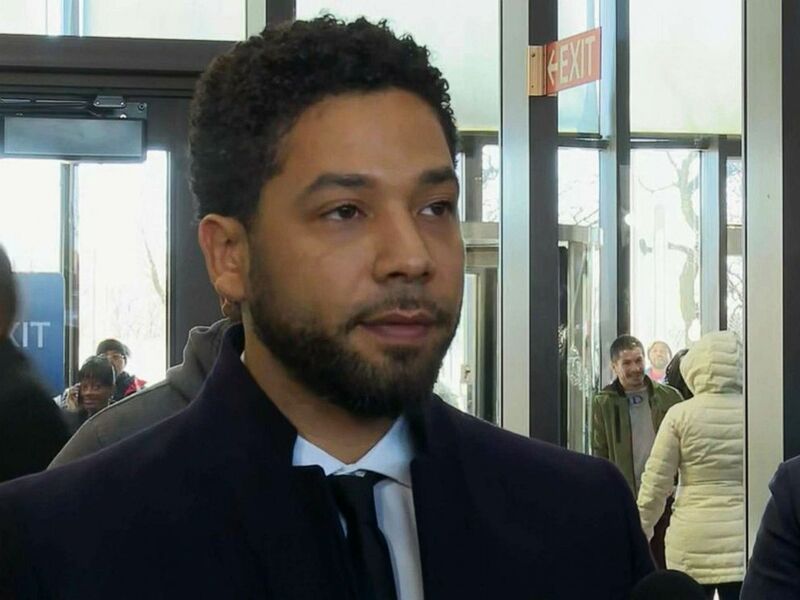 Gloria Schmidt, the attorney for the two brothers, said Tuesday they had been willing to testify against Smollett. "The Osundairo brothers were fully prepared to testify in any criminal proceeding in the Jussie Smollett case," Schmidt said in a statement. "Following today’s decision ending the criminal case against Smollett, Gloria Schmidt no longer represents the Osundairo brothers as trial witnesses in the criminal matter." Asked if the brothers should be charged and prosecuted, Holmes said, "We don't want to try them in the press anymore than he [Smollett] wanted to be tried in the press." 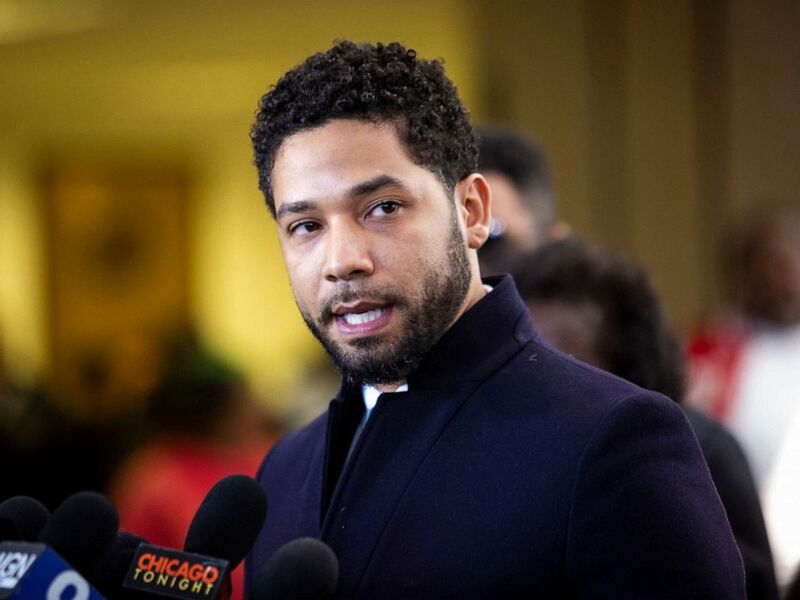 Actor Jussie Smollett speaks to the press after all charges were dropped against him in Chicago, March 26, 2019. In a statement released shortly after defense attorneys announced that the charges were dropped, Smollett's family reiterated the actor's innocence, and subsequent victimization by skeptics. "Our son and brother is an innocent man whose name and character has been unjustly smeared," the family said in a statement. "Jussie is a son, a brother, a partner, a champion for human rights, and a genuine soul who would never be capable of what he was falsely accused of. He was the victim of an assault and then falsely blamed for his own attack. This morning truth has prevailed and he has been vindicated. All charges have been dismissed and his record expunged (cleared). "The painful incidents we’ve witnessed him endure over the past 7 weeks have been heartbreaking and unjust to say the least. While many were quick to rush to judgment before hearing the actual truth, we are grateful that the truth about Jussie has come to light. We look forward to bringing the real perpetrators to justice. We thank God and our village for standing by us during this trying time." ABC News' Josh Margolin contributed to this report.